Well, *obviously* it's not a coincidence. Obviously he hasn't somehow stumbled across just happening to use the same title as a Sisters Of Mercy track, especially not a title like that. It's a cover. Obviously it's a cover. It's a wonderfully odd choice to cover yet The Bluetones' Mark Morris has managed to uncover a beating pop heart at the centre of the Sisters' original doom laden, reverb soaked masterpiece, putting an upbeat positivity into the track that Eldritch and co possibly never envisaged. Still kept the black leather gloves and aviator shades from the original though. Preserving the vibe. I didn't discover Joy Division until August 1980. Love Will Tear Us Apart on the radio in a rented house in Newquay. As I recall it, Top Of The Pops was off air due to a muscians' union strike, NME, Melody Maker, Sounds etc off the shelves for similar reasons. I heard this song with no filters, no explanation. I had no idea whether I was supposed to like it or not; it was very slightly unlike anything else I'd ever heard. It chimed though. It said something. I had no idea that Ian Curtis was already gone before I heard his voice. I went home, I bought Unknown Pleasures. Didn't know if it was the first album or the second but loved the cover. Bought Closer, bought Love Will Tear Us Apart. Listened obsessively. Then found that THIS existed. A 12" single when that was the most important thing that there was. A reissue. A reissue of one side of a double A that had originally appeared only in France. Atmosphere. There are days when I believe that this is the single greatest piece of music ever made by human hands. There are lots of those days. Today is one of them. Today is the 35th anniversary of the day that a young man tragically took his own life and left a legacy that has never dated and has carried his spirit with it every step. RIP Ian Curtis. Another band we've featured before. We'll undoubtedly feature them again 'cause they're bloody smart. They've still got that effortless, lazy, smouldering Dinosaur Jr vibe going on. They've got guitars that sound gorgeous and harmonies that haunt you. They've got two tracks here for your delight and delectation; 'It's On You' and 'Montreal Rock Band Somewhere' which contains the wonderful couplet “I'm wearing Win Butler's hair / There's a scalpless singer in a Montreal rock band somewhere”. Let's not quibble about the fact thatWin Butler has terrible hair and you wouldn't really want it as any kind of fashion accessory and concentrate on the grace and the beauty and the bass and the guitars. Oh. And. Look at the tour. Real tour this. Proper tour. Pressed play on the Soundcloud link without reading the press release. Might be worth you doing the same before reading on, see what you think. https://soundcloud.com/goldsmack/sets/a-wild-wild-season-1/s-o7BNP Right. Are you back? Cool. We agree then. Wow. Just wow. The visuals made me think that I was getting some kind of modern house act. All trippy dance beats, big pianos, that kind of thing. If I'd read the press notes for this taster for their debut five track EP first, I'd have known what I was getting into. As it was, I made the same comparisons myself. And bloody good comparisons they are too. A bit of Nick Cave, a bit of Ennio Morricone - which became pertinent when I realised that this 'psychedelic power pop trio' are Italian by birth and base - and one hell of a lot of Lee and Nancy. (Hazlewood and Sinatra if you weren't sure). This is Sand, this is Summer Wine, this is quite definitely Some Velvet Morning. This is something else. This. Here. This is the start of genius. This is genius which will last forever. It will move beyond the confines of the four years covered in this (beautiful, essential) box, it will invent and influence, it will educate and it will innovate. It will lead to the majesty of 'What's Going On', the deep soul of 'Trouble Man' and the bitter beauty of 'Here My Dear'. It will move forward to the soundtracks to a million moments of love that are 'Let's Get It On' and 'Sexual Healing' and 'Trouble Man' is being released on individual vinyl alongside this, 'Let's Get It On' in Blu Ray audio but for now, let's look at the start. The first seven albums all here; his 1961 debut, The Soulful Moods of Marvin Gaye, That Stubborn Kinda Fellow (1963) and When I’m Alone I Cry (1964), in stereo for the first time ever in the LP format. 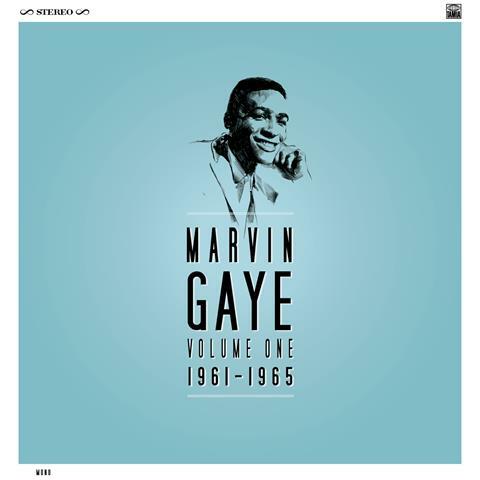 The collection also includes Hello Broadway…This Is Marvin (1964); Together, his 1964 album of duets with Mary Wells; How Sweet It Is to Be Loved by You (1965), and A Tribute to the Great Nat “King” Cole (1965). 'The Soulful Moods' is a slight misnomer in that there's a jazz feel to the set; his take on the classic 'Witchcraft' is raw, live, vital, in the studio, sat next to you, entrancing you. 'That Stubborn Kinda Fellow' gives us the class of the title track and the sheer joy of 'Hitch Hike' (ask Lou Reed how great that song is - he stole the intro quite happily). His work with Mary Wells is, it should go without saying, timeless, era defining and gorgeous. 'How Sweet It Is..' has THAT title track and ''A Tribute To The Great Nat "King" Cole' sits alongside the works of the master himself; classy, elegant, like bathing in velvet. Marvin would have been 76 on April 2nd. This set, out on May 18th, is fitting tribute.